Click SPON button, then AM. Select the folders as input directories where STEP 2 outputs. Change filetype to dnoGSR*.nii. Select output directories. Click ALFF/fALFF button in SPON GUI. Select the folders as input directories where STEP 2 outputs. Change filetype to dnoGSR*.nii. Remember that TR cannot be 0. Select output directories. Click ReHo button in SPON GUI. Select the folders as input directories where STEP 2 outputs. Change filetype to dnoGSR*.nii. Change nbr type to 6 (face neighbor), 18 (edge neighbor) or 26 (vertex neighbor) if necessary. Select output directories. Click FCD/FCS button in SPON GUI. Select the folders as input directories where STEP 2 outputs. 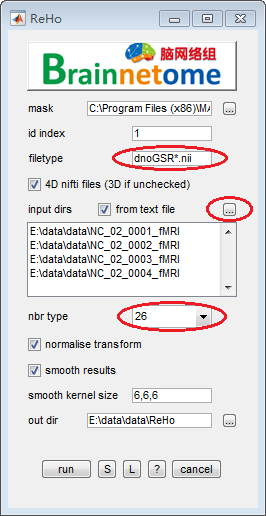 Change filetype to dnoGSR*.nii. 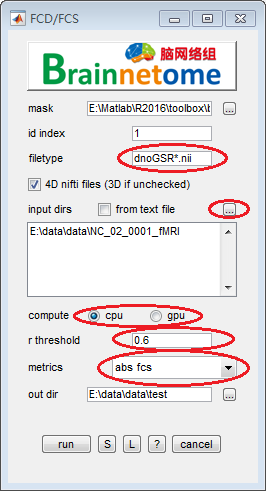 The computation can use either OpenCL supported CPU or GPU. Select output directories. You can also calculate FCS with absolute value if necessary by selecting the abs fcs in metrics. Make sure your graphics drivers are up-to-date before using FCD/FCS function.